If you're looking for a fun evening with a gathering of family or friends or some special occasion, then Kobé Japanese Steakhouse & Sushi Bar is worth a try. You'll certainly be entertained. It does come at a price, though, and that's that the food is mediocre at best. So there is a trade-off: great fun, yes; great food, no. I was at Kobe recently for a retirement dinner for a former coworker. We all had a very good time and it was a lot of fun. That said, the food was a letdown. My shrimp were well over cooked and rubbery. The stir fried rice was somewhat flavorless, and the low mein noodles only slightly better. The stir fried vegetables, however were very good. I would recommend you come here at least once for the entertainment. You may be back a second time, but it will not be for the food. I had perhaps the best ever snapper at Garlic Crabhouse the other night. I really mean the best ever. It was truly a delight. Garlic Crabhouse is not a fancy place, it's more of a diner feel. But boy did I sure feel welcome and well taken care of when we stopped in here for dinner recently. 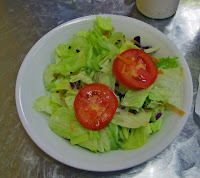 I started my meal with a salad which was pretty ordinary, standard diner-type of salad, with ranch dressing in a big ole plastic squeeze bottle--one of two choices. It was good and fresh, no complaints. But then the gem of the meal arrived. 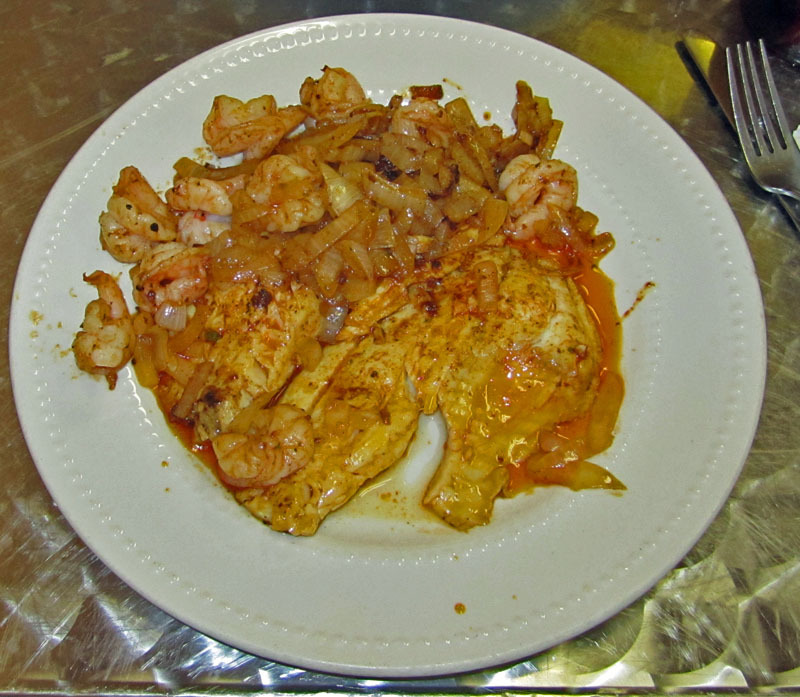 I chose a dinner which had snapper and shrimp, prepared jerk-style. The shrimp were good, not over cooked. The jerk was very mild. But the snapper. Oh my! It was absolutely awesome. 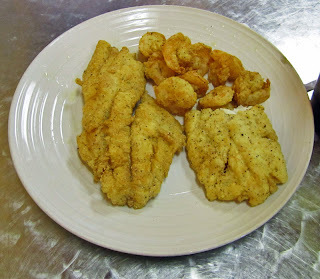 Tender, moist, creamy, flavorful--it was everything good fish should be--and more. I think it was about the best fish i have ever had in my whole life, and that's a high compliment. To go with our meals we had a variety of choices. Mine were salad, red beans and rice, and cabbage. Tommy had the corn on the cob instead of a salad. 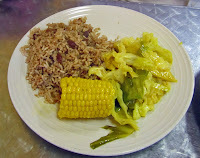 The red beans and rice were very good, as was the cabbage. The corn was a bit overdone, though, but still edible. Tommy had the fried tilapia and shrimp, ant it was also very good. The breading was nice and light, cornmeal based, and very good. 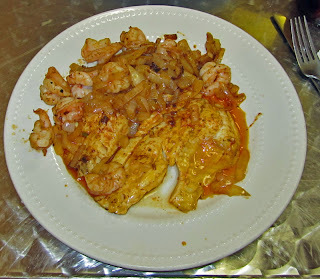 His shrimp were perhaps just a bit overcooked, but the fish was spot-on. We had very attentive service during our meal by two of the waitstaff---they were extremely helpful and pleasant. Overall, our experience here was very good. I'd certainly go back again. And again. And again! What a delightful place. We are fortunate to have this market/deli in downtown Sanford. Hollerbach’s Magnolia Square Market is the market arm of the famous German restaurant, Hollerbach's Willow Tree Café. The Willow Tree is currently the #4 top restaurant in Orlando according to Urbanspoon.com, and it's with good reason. I was in Sanford at the Saturday Farmer's Market recently, and stopped in to see what progress they'd made since they first opened about a month or so ago. It's a lot of progress. When we were there, the shop was lively with quite a few people shopping and looking around. 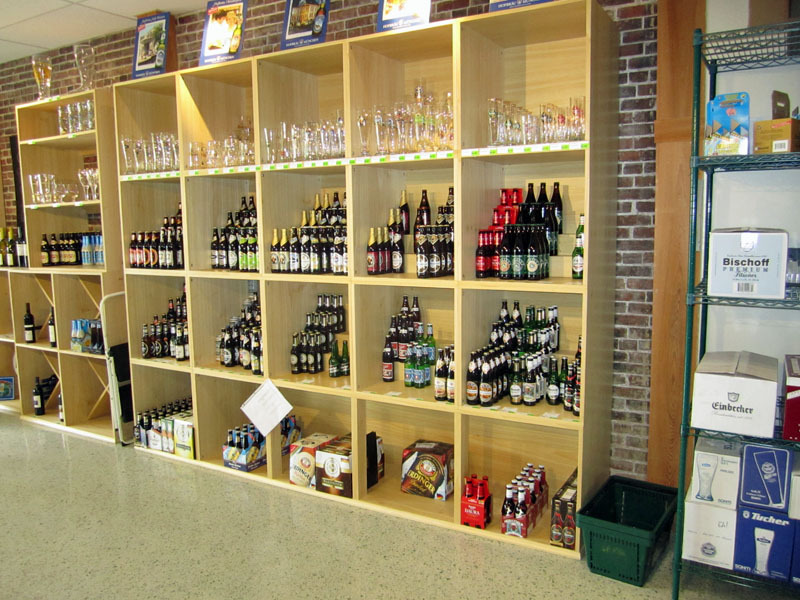 They have an extensive selection of German products, cans, jars, packages. They also have a nice deli section with everything from potato salad to fine sausages and meats. Something for everyone who loves German food. They also have a nice selection of German Beers, probably the best selection in the area, with fair prices. I'd guess that if you can't find your favorite German beer here, it's not to be found in the state! 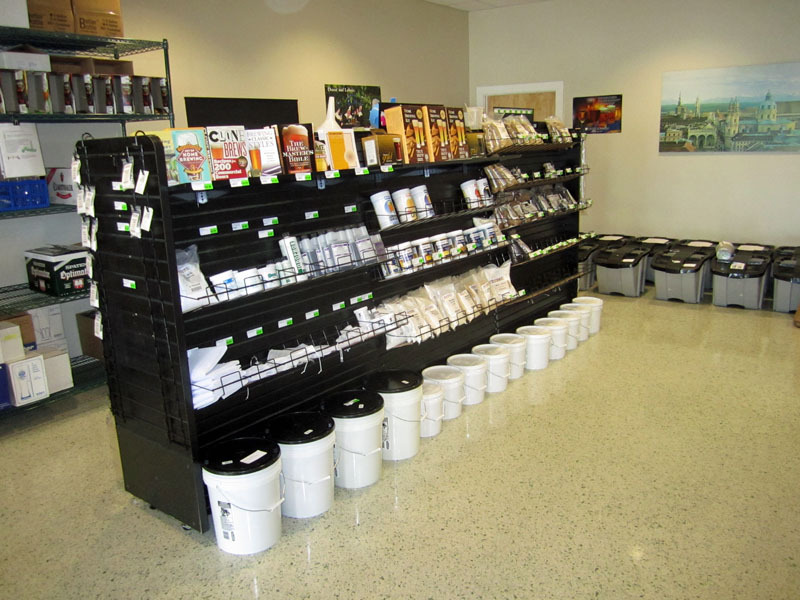 As if that weren't enough, they also have a fine (and growing) selection of home brewing supplies! Grains, malt extracts, hops, yeast, and brewing equipment, they have it all, and a wish-list for what they do not have. A brief conversation told me that they have quite a few people signed up for home brewing classes, too. This is a great addition. 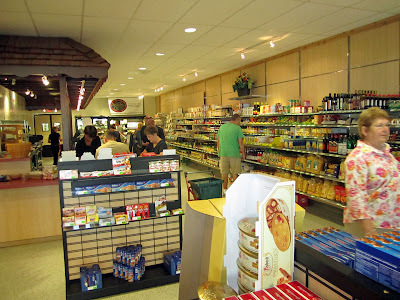 As if that wasn't enough, I have just learned that one of their long time employees, Janet, is writing a blog about her experiences and the selection of food items at the Market. The blog is called Magnolia Square Market's Blog, or American Girl in a German Deli Blog! Check it out, it's very interesting. And if you spend any time at the Willow Tree, you will recognize Janet, she's often the hostess, and the server for Alive After Five events. I really like this place and am sure to be back. Check it out! I enjoyed my first--but not last--Carmela's experience the other night. Overall, this was a very good experience. With a few tweaks, it would have been great! We started out with a small (13") pepperoni pizza as an appetizer. 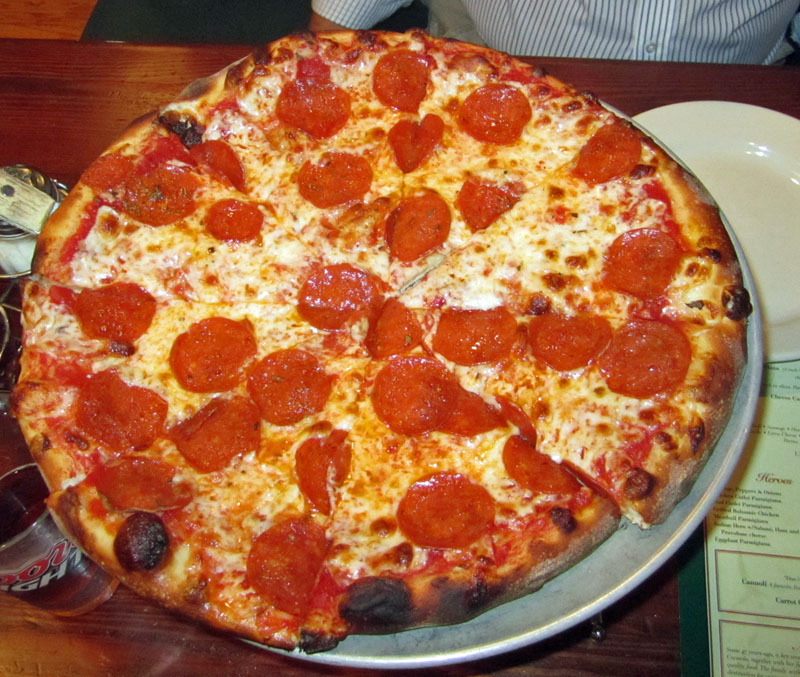 If you claim to be a New York pizzeria, you better deliver, and Carmela's did! The pizza was fabulous, all that I'd expect a NY style pizza to be--cheesy, crisply, nice pepperoni flavor, just wonderful. But we knew we'd be eating more, so we only had two slices. But I will tell you this: it was equally good the next day when reheated in a hot oven on a pizza stone--a great reliving of the original experience. What a fantastic pizza, I'd come back just for that alone! For his entree, my friend Tommy had the Penne with Grilled Chicken. First off, the chicken itself was awesome, it had a great grilled flavor and was nice and tender. However, there was something missing from the dish. It needed something to make it a bit special, including a bit more salt. I don't think the cook/chef tasted the sauce. 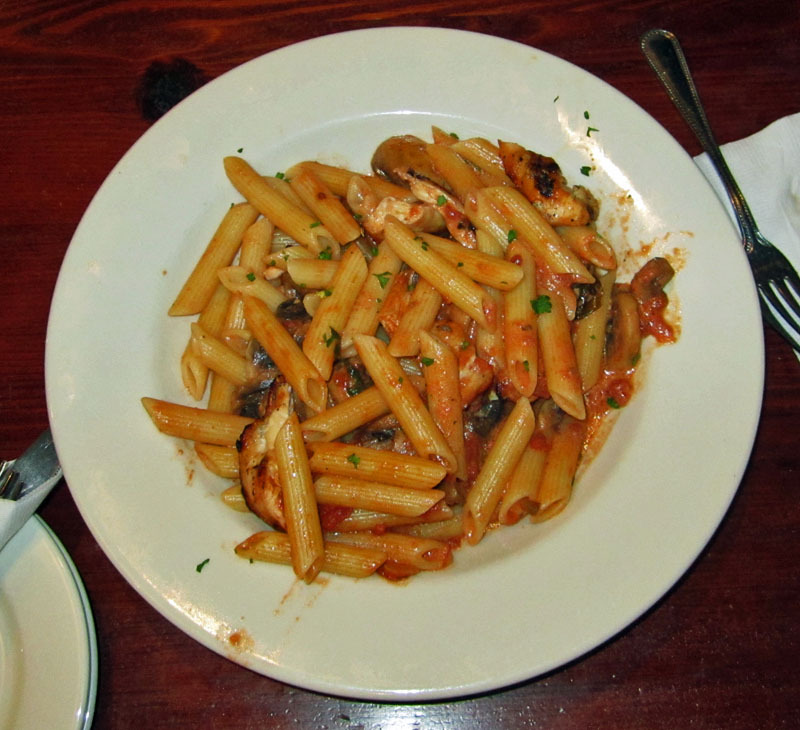 The mushrooms were nice, the penne was good, but there was some small element missing. Additionally, the presentation was just a bit plain. The big, wide-rimmed plate first of all needed a bit better cleaning, but it also needed something, like a little dusting of Italian Parsely--that small touch would have made a big difference in the presentation. But the somewhat blandness of the sauce was indeed saved by the awesome flavor of the chicken. 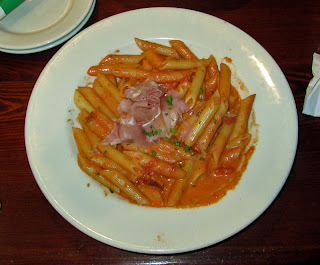 For my entree I had the Penne a la Vodka. Wow. first the only (and minor) bad--again, the plate lacked a good look. Just a bit of cleaning of the plate and a smattering of parsley on the wide white rim would have really set this dish off. However, the flavor was spot-on fantastic. It was really good. I think maybe the proscuitto should have been more finely diced and fried just a tiny bit, but in the flavor department, this dish really rocked. The vodka creame sauce was awesome, maybe the best I've ever had, and I'm not one to give out such compliments freely. This was an amazing dish and I'd urge you to give it a try. It was wonderful. We really had our fill after this (and had some additional leftovers) but the 2 for $2.20 Canneloni special called our names, so we tried that as well. They were very good. The shell itself was very crispy and crunchy, a nice texture balance to the creamy and very sweet filling. I'm not a huge "sweet" fan but these were very good. 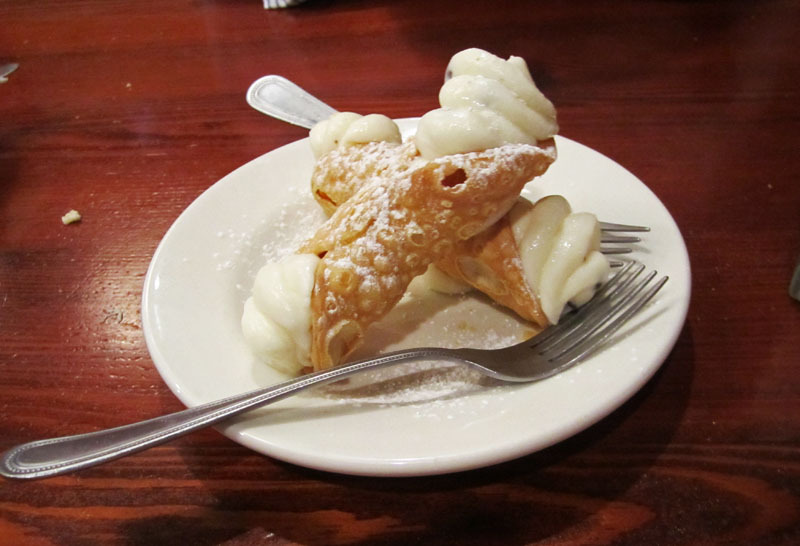 Overall, our experience was very good, and I'd recommend Carmela's to others--it was very good. There were a few mis-steps, though, and our service was one of them. At first, our server Michael was a bit attentive, but as time went on he was more and more absent. A bit more attention to customers is crucial to success. Maybe he was new, but I hope he learns. Also, the plating was a bit sloppy and a bit plain. But overall, with a few seasoning adjustments, the food was spot on--and the pizza simply outstanding. I'd sure go back again! Join me in downtown Sanford this Thursday evening for Alive After Five. Alive After Five is the Orlando area's best kept secret, but slowly the word is getting out. Thousands of people come out on the second Thursday of every month for this street party. Though the event itself and the live music is free, if you want to partake of the many food and beverage samples (including adult beverages) there is a very modest $7 charge for a wristband. 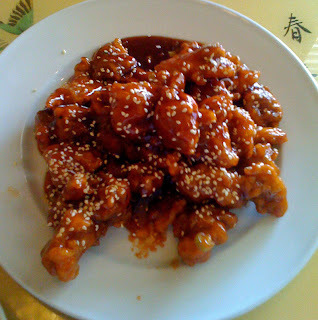 Very mediocre--at best--that's how I'd describe my visit to Cheng's Chinese recently. I have been looking for really good Chinese food in central Florida, but did not find it here. I probably will not go back for dinner, though rumor is that they have a nice lunch buffet--maybe I'll try that some day. My friend Tommy and I went to Cheng's on a somewhat rainy Sunday afternoon. We were one of three tables there, though the others were finishing up. We both ordered combination meals. The Egg rolls were very good and very hot! They had a nice crisp exterior with fresh napa cabbage and other vegetables inside, and quite full. They were indeed good, but probably the high point of my meal, unfortunately. For soup I had the Hot N Sour soup. 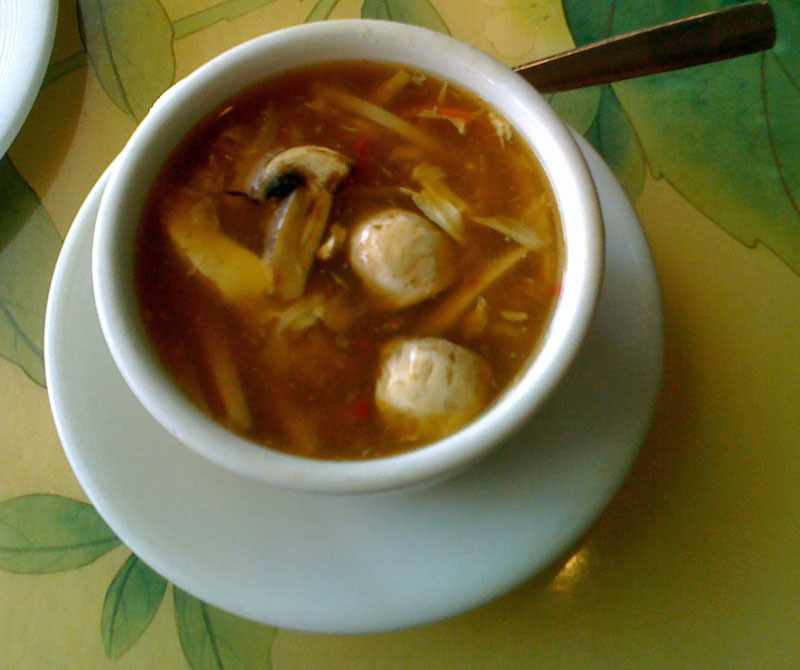 I love Hot N Sour soup and am always on a quest for the best, but this soup fell far short. It was not terrible, but was missing on the sour part--it needed some more acid. 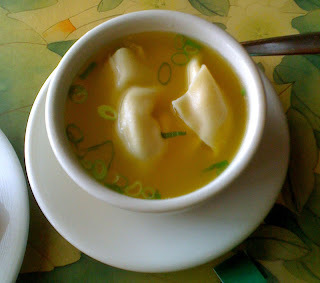 And there was a very pervasive taste of chicken broth, to the point of distracting from the other flavors. I would not order this again. My favorite remains the Hot N Sour at Lee's Palace, just a few miles away. My friend Tommy had the Won Ton soup and I had a taste. It was OK and also a bit on the chickeny side. But it was good, just not more than ordinary, however. For my entree I had the General Tso's chicken, advertised as "spicy" (and not pictured here). It was not spicy at all, or just barely. And the chicken was downright tough and stringy. I thought "this is an old bird." The meat seemed to be mainly dark meat, the sauce covering it was very sweet, too sweet, and quite thick, almost to the point of pasty. It just was not all that good. Tommy had the sesame chicken. It seemed to me to be the same dish I had with an overyly sweet, pasty sauce. The difference being some sesame seeds thrown on the top of his, whereas mine had a few chili peppers in the sauce. Other than that, they were identical, down to the chewiness and toughness/stringiness of the chicken. I would not recommend this, nor my dish, to anyone. We both had the pork-fried rice that came with our combo dinners. It was spectacularly bland and ordinary. The rice did not appear very fresh, the pork practically non-existent, and pretty much devoid of much flavor at all. When mixed with some hot mustard or soy sauce, at least there was mustard or soy sauce flavor. Otherwise, it was just bland, bland, and bland. Overall, Cheng's Chinese is a nice-looking place inside. It looks like your typical Chinese restaurant with a nice atmosphere. The only thing I found lacking was authentic Chinese flavor and cooking in the food. That's too bad. I sure hope this was chef's day off, because if this is what they normally serve, then people of Lake Mary have no clue as to what good Chinese food is all about! My recent lunch at Blackwater Bar-B-Q was a bit disappointing. I'd heard good things and saw some good reviews, but I found it to be nothing other than ordinary. A coworker from out of town was visiting, and I chose this place to meet. It was just OK however. I had a lunch special, pulled pork with two sides. There was a decent helping of pulled pork piled between two thick but otherwise ordinary slices of plain white bread--as one reviewer said, garlic toast or something would have been nice. 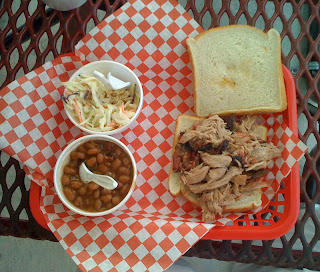 The pulled pork itself was tender and juicy, but upon inspection, i could not find any bark, no smoke ring, and it really didn't have a smoky taste or smell. It was just tender pork, nothing to speak the "Bar-B-Q" in the name of this place. It was good, just didn't speak to me. The two sauces on the table were likewise somewhat unspectacular, one a bit more sweet than the other which was maybe just a tiny bit more spicy. Either or both could have been out of a bottle. 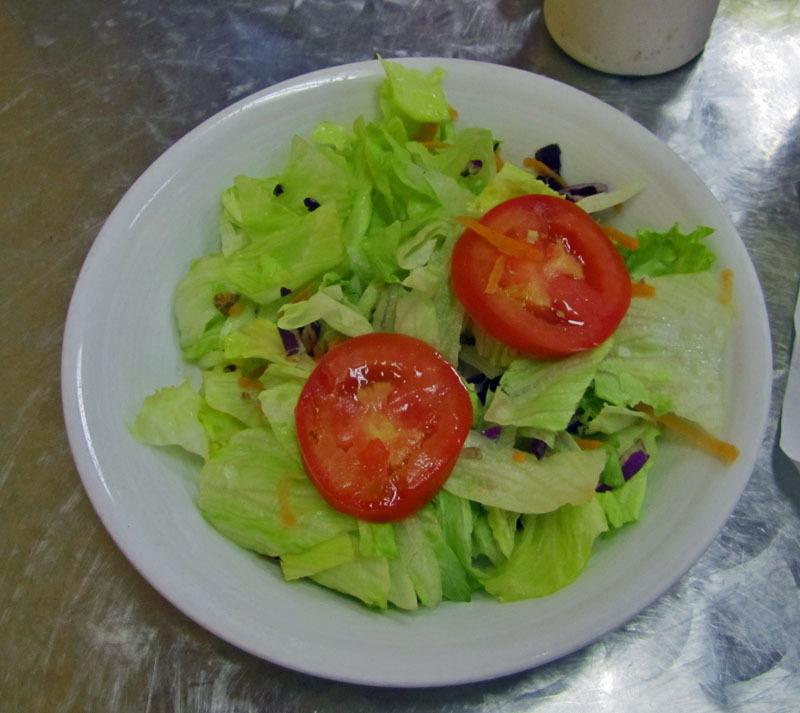 The coleslaw was OK, it's hard to make bad coleslaw, and a bit on the dry side. Tasty, still. I'd high hopes for the beans, as the waitress said they were homemade. But they tasted to me like beans out of a can to which a few pieces of pulled pork had been added. The did not say "Bar-B-Q" at all to me. They were tasty enough, just not special. I am sad to say my experience here was disappointing. I may consider going back and trying for something that really can show evidence of smoking, such as ribs, but right now, I won't place a priority on that when there are so many other better BBQ joints around. Bummer!